Every other fall term, English 204 (Theater Production and Performance) produces a full-length play as its main class project. After about 6 weeks of preliminary study and research into the techniques of working up a production, the class and other participating students have approximately one month to ready the chosen work for public performance. The style of play being produced varies each time the course is offered; in the past, English 204, backed up by the enthusiastic members and resources of LVC’s student theater company, Wig & Buckle, has staged Greek tragedy (Antigone,) modern European fantasy comedy (the Madwoman of Chaillot,) contemporary American social drama (The Voice of the Prairie,) 18th century Irish farce (The Prisoner at Large,) Brechtian “Epic Theater” (Galileo,) and a world premiere of a new work (Katie McCarty’s I Think You Should…). This year, English 204 and Wig & Buckle are pleased to offer up for your consideration a new work that fits into the subject of our year-long campus-wide LVC Colloquium discussion on society and the communications revolution, “Wired”, the 2008 comedy Dead Man’s Cell Phone, a darkly amusing play by one of The nation’s great emerging dramatic authors, Sarah Ruhl. 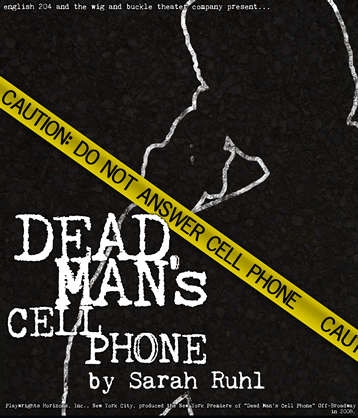 Dead Man’s Cell Phone begins with a nuisance all too familiar to most of us—peace and quiet interrupted by the unanswered jangling of a stranger’s cell phone in a public place. The play’s protagonist, Jean, a young woman conditioned to be polite to everyone and to think the best of her fellow human beings, finds herself on the receiving end of someone else’s—to be specific, a dead someone else’s—untidy and shattered communications network. It is the weird and wonderful journey of discovery on which Jean feels compelled to embark that forms the substance Sarah Ruhl’s episodic absurdist comedy; along her way Jean will explore dangerous places—dysfunctional family ties, shady international businesses, romantic illusions about true love, and an afterlife consisting of empty cafes, crowded laundromats, and pipelines to other peoples lonely places—and we will, along with Ruhl’s characters, be asking ourselves how these new technologies alter what we think of as our essential humanity. We are proud to be the first theater company in Central Pennsylvania to stage this work; to do it, the cast and staff have had to learn a whole new style of theatrical presentation—4 of the 6 speaking characters in tonight’s show are being performed by actors making their LVC debuts. I am happy to have had the privilege to once again take part in a creative process that demonstrates the value of student-faculty collaboration in a liberal arts education. Thanks for your patronage.